The Garland Community Garden--one of the few places in the DFW area where you can see hops growing and blooming. 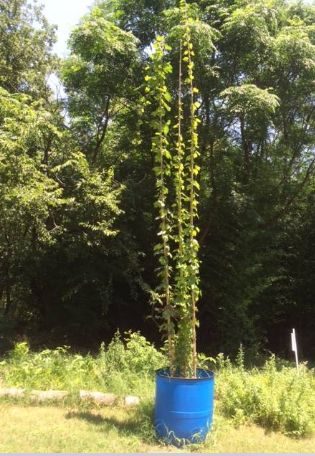 Last year we were curious to know if hops would grow well in Garland. We called a few growers (five) throughout the USA--from Oregon to Massachusetts. All of them gave encouragement and they all suggested "Cascade" as a variety. We planted the Cascade rhizomes in March of 2015. Their first year they were somewhat wimpy and only made it up about ten feet and produced about 12 flowers. This year the bines are much stronger and we have at least 30 blossoms. I thought this morning about loading up one of the hops barrels and taking to downtown Garland so more people could see them, but then I realized that would not be feasible because of the electrical wires in between the garden and downtown. So if you want to see hops growing, you'll have to come to 4055 Naaman School Road - Garland 75040. Garden Talk Monday June 27--Come and Learn. 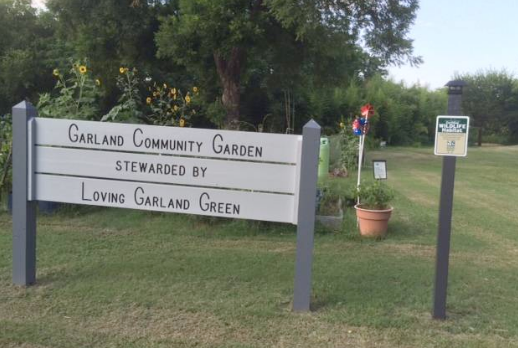 CA Hiscock, a Dallas County Master Gardener will be the guest speaker at an event hosted by Loving Garland Green at the downtown public library 625 Austin Street Garland, Texas 75040. Monday June 27, 2016 – 6:30 to 7:30 PM. Kevin Keeling, Loving Garland Green Board Member installs a trellis for one of our many healthy blackberry bushes at the Garland Community Garden. Garland Community Garden Clean Up Was a Great Success! 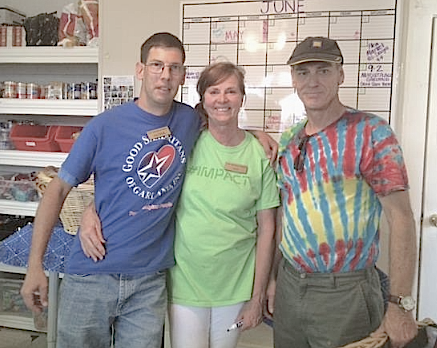 This Saturday, June 25 was Loving Garland Green’s end of the month garden cleanup. Altogether we contributed approximately 24 people-hours in one Saturday morning. Gene and Margie brought two weed eaters while many of our other members did their own version of “weed/grass eating” by pulling the stuff up with their hands. I assisted Kevin Keeling in installing a great trellis for one of our larger blackberry bushes in the front area of the garden. Kevin drove the rebar supporting the wire for the trellis goes about 2 ½ feet in the ground. We then used zip ties to attach the wire to the rebar. Later we will put wire over the zip ties for permanence. We still have a little bit more grass to remove from a few of the beds, but all in all, the garden looks great! In addition to other vegetables, we have six tubs of sweet potatoes and one bed of them. Instead of a "pumpkin patch" for the kiddos on Halloween we will have a sweet potato dump. The sweet potatoes are harvested between Halloween and Thanksgiving--before the first hard freeze. After harvesting the potatoes need to cure for a week to 10 days before eating--otherwise they will taste bland and unexciting. 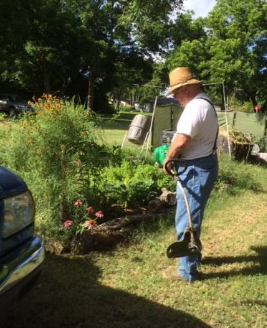 Burgi Bartlett, Loving Garland Green board member pulling weeds from the Medicine Wheel in the garden. 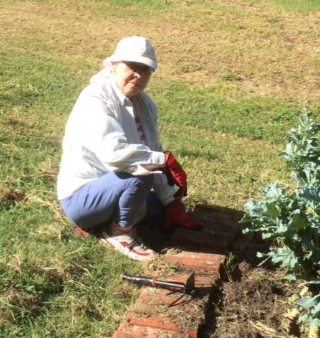 Margie Rodgers, one of Loving Garland Green's founding members, weeds a bed to perfection. The grass yields to Gene's mean weed-eating machine. Gene, a Loving Garland Green board member, worked hard on Saturday. A New Sign is Added to the Garland Community Garden. The smaller sign at the right was added yesterday. 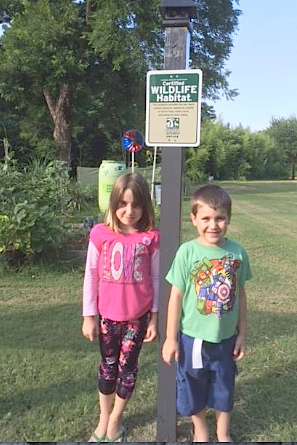 It identifies the garden and surrounding area as a National Wildlife Federation Certified Wildlife Habitat. We obtained our certification about two months ago. Charlie and I posted the sign last night with the assistance of two small helpers, Erin and Jack. Again kids love gardens. 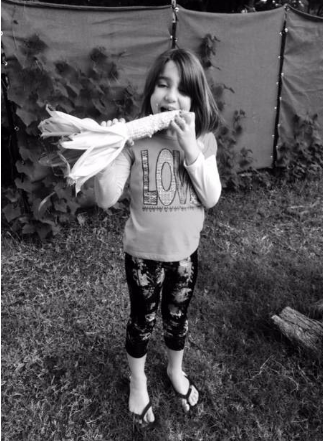 If you don't have a garden to share with the kids in your life, bring them down to the Garland Community Garden and let them run amok. 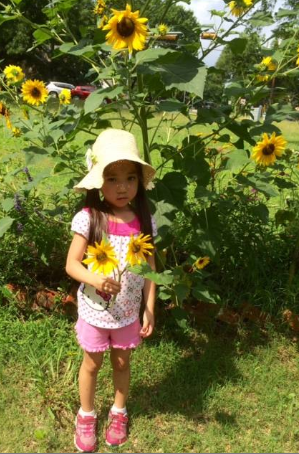 No one enjoys the freedom and mysteries of the garden quite as well as children. We have lots of shade trees too. Speaking of kids and gardens--at the Garland Community Garden you can never know who will drop in while you are there. For example, Robert Opel, one of the members of Loving Garland Green happened to stop by when we were down there last night. He had three ears of corn with him and pointed out to the children that you don't have to cook corn. You can just shuck it and eat it. Erin was not only game to try it, she shucked an ear and ate the entire thing. Speaking of Robert . . .
Robert and Anita with tin butterflies cut from license plates. On Tuesday Robert and Anita were down at the garden to water and pull a few weeds. 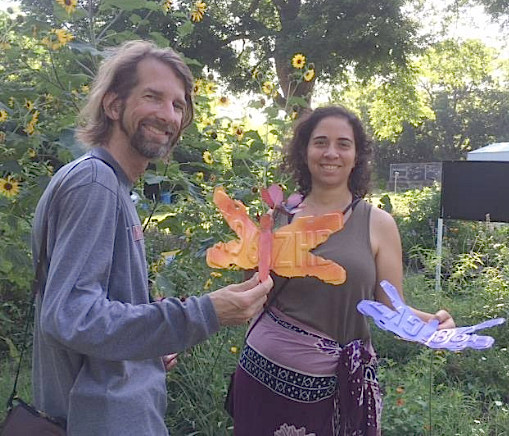 They brought with them two butterflies and a flower made by a local artist to donate to our butterfly garden in front. And speaking of members of Loving Garland Green . . . It's our members who work so hard to make sure the garden is a fun and interesting place to visit. For example, on Sunday Chris watered the garden, on Monday of this week Burgi and Marie watered the plants, on Tuesday it was Robert and Anita, on Wednesday it was Jane. Also on Wednesday Gene Rodgers mowed. Cheryl was down pulling grass this week too. If you want to join the fun, join us all on Saturday when we have a community work morning from 8AM to Noon--doing all kinds of things to get the garden in shape. If you can't make this Saturday, attend our monthly speakers meeting. For June, it's at the Garland downtown public library on Austin Street, Monday June 25 from 6:30 to 7:30. The topic is "Can I eat that?" It will be presented by a member of the Dallas County Master Gardeners. MORE GARLAND GARDEN NEWS! Charlie is Growing Large Tomatoes this year! 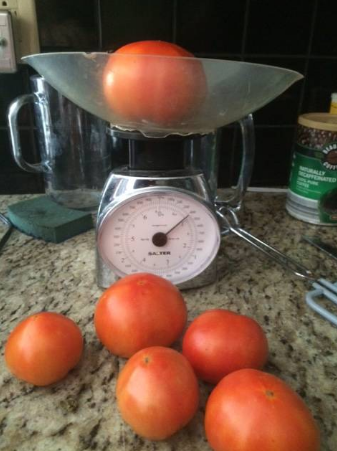 Below is a one-pound tomato he picked this morning. Just this morning Charlie picked 14 1/2 pounds of tomatoes. To date for this season he has picked 54 pounds of tomatoes! Altogether this growing season Charlie's garden has produced 78 pounds of produce. 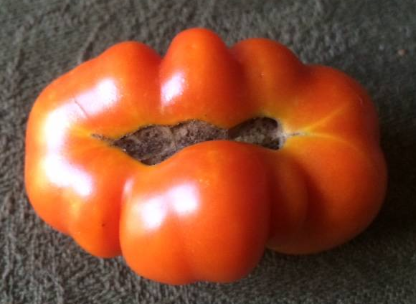 What do you do when you find a tomato that looks like this? YOU HAVE SOME FUN WITH IT! Mike, Gail and Vicki, Garland Good Samaritans volunteers pose in front of the container garden. Only a few days away until summer begins—even though it feels like it started about five days ago with the heat. I don’t know about you but all I’ve wanted to do the past few days is lie around and read murder mysteries. 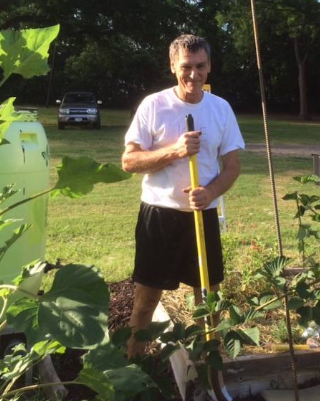 However, with assistance from Charlie I did muster up enough energy to plant another laundry basket of sweet potatoes, and harvest some vegetables from the Garland Community Garden to make our weekly delivery to the Good Samaritans here in Garland. I also bought an eggplant and pepper plant to replace some spent kale in our container garden at the Good Samaritans home. Thus far this year Loving Garland Green has delivered approximately fifty pounds of fresh produce to local folks. Eight pounds of this delivery are blackberries. We still have about three weeks of production so I’m expecting another ten pounds. Again, if you have room, I can’t say enough for the productivity of blackberries in Garland—in addition to the general lack of care they require. Sweet Potatoes in a Laundry Basket at the Good Samaritans of Garland--Six to eight sweet potatoes will be ready to harvest between Halloween and Thanksgiving. In the meantime a prolific vine will grow over the wire trellis in this basket--a pretty and edible sight. The sweet potato leaves can be harvested for the next four months to provide a delicious addition to salads and stir fries. 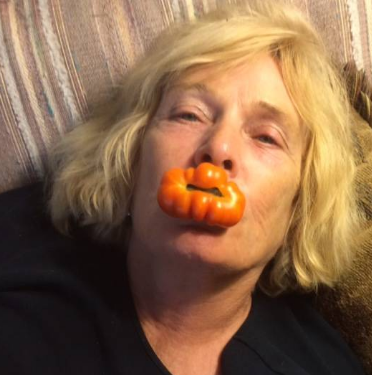 This week we had about a pound of tomatoes to deliver and two pounds of green beans. Next week the tomatoes will really start producing down in the garden. I’m hoping to have a lot more tomatoes to deliver next week. By the end of July the various melons (watermelons, cantaloupe and Asian melons) we have growing will start producing. Do I have a lot of stuff to haul down to Charlie’s today!—not only my stuff, but stuff that Burgi, a Loving Garland Green board member, has delivered to my house. This sale promises to be a great opportunity to get a lot of good stuff. Already his living room and one of his bedrooms is filled with things. One of our fabulous offerings at this sale will be a complete set of vintage Villeroy & Boch Fasan Green Willoware from Germany. This service for eight includes the serving dishes as well. If you will consider that EBay offers four cups and saucers from this set for $98.95, you will understand that at $200 for the entire set the buyer will be getting dishes valued at more than three times that amount. If we are not able to sell the set for $200, we will sell them on EBay. In addition to the dishes we have hundreds of other unusual items. Please come and help support a deserving non-profit organization in the DFW area. Loving Garland Green is hosting another great presentation from the Dallas County Master Gardeners. 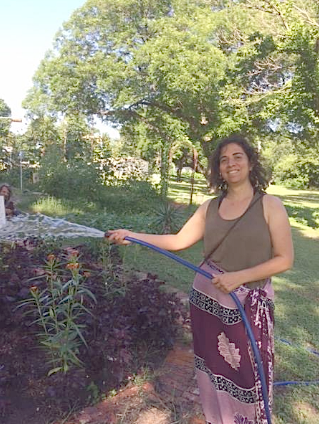 We invite you to come support the Garland Community Garden. We need help pulling the grass from our beds. In addition to plenty of cold water, we also are offering a tour of the garden from 9 to 9:30 AM. Come learn about your community garden and how you can participate. There should be a few blackberries left for the children to pick. Even though the photograph above was taken only a few hours before this article was written, it is nonetheless, a timeless snapshot that could have been taken in any garden over the last hundred years. Gardens, teeming with the mysteries of life and containing countless universes of microorganisms, continue to be an irresistible attraction for children and many adults. Endless stories are played out in the garden 24/7 and most of them go unobserved—even by the most attentive of gardeners. 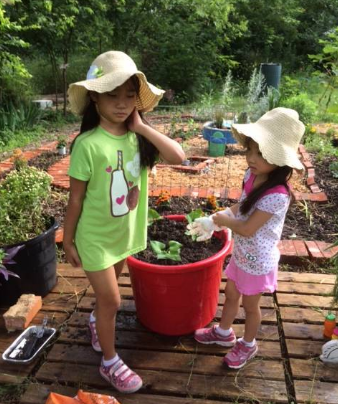 Yesterday Huong Le called to ask if she and her two daughters could join me to work in the garden today. Of course I said “yes”. First of all I already know Huong Le and her daughter Jeannie. Jeannie was in a botany elective class I taught at Beaver Tech here in Garland last year. Secondly, I never turn down any offers to lend a hand in our community garden. The girls and their mother are not only brilliant and beautiful, it turns out they are natural gardeners as well. 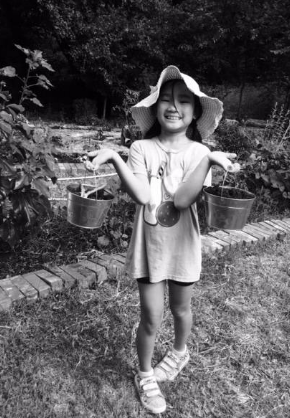 My first thought when Huong Le called yesterday was “Great, I’ll put them to work pulling weeds.” However, later in the day I had second thoughts. After all I wanted the girl’s first experience in the Garland Community Garden to be one that would yield happy memories upon later reflection. CONTAINER GARDENING SO EASY A CHILD CAN DO IT. 2. Drill ¾ inch holes in the bottom of the basket. 4. Put a mixture of potting soil, organic garden soil and vermiculite in about 1/3 of the pot. 5. Stick the wire fencing on top of the soil (curving the fencing against the sides of the tub. 6. Pour the rest of the soil into the pot. 9. Cover with straw mulch. 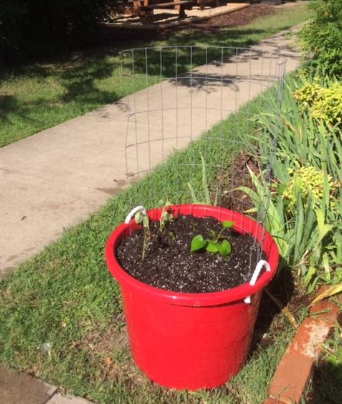 If you are really lacking for space and have no room even for a laundry basket, and you still have aspirations to be an urban gardener, you can stretch the concept of container gardening to its limits. 1. Buy a certified organic sweet potato at your local grocery store or farmer's market. 3. Pour water in a glass or plastic container. 5. Place the potato in sunny spot in the house. In about three weeks the potato will begin to sprout vines and leaves. Once it has achieved substantial growth you can begin clipping the leaves for your salads and stir fry dishes. The leaves taste somewhat like spinach only nuttier. Their best flavor is when the leaf is small to medium. Like all living things, the leaves get tougher with age. It was a delightful and productive morning in the garden. 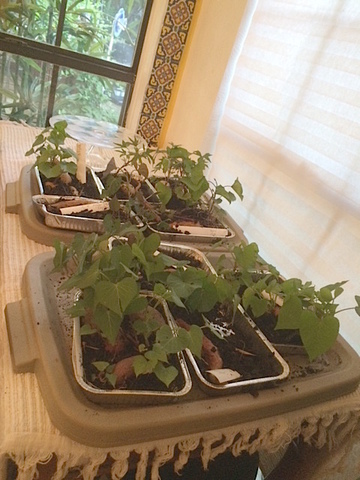 In addition to building a container garden for sweet potatoes the girls also picked blackberries, watered, and planted two tomato plants, two basil plants, one lantana and numerous marigolds. 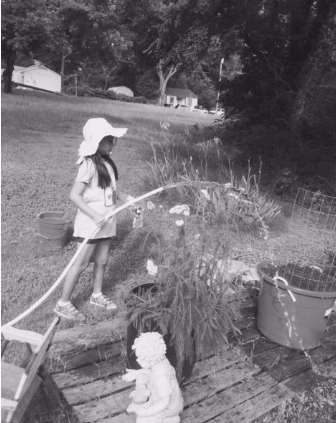 It is difficult to say which garden task Zoe enjoyed the most--picking flowers or watering as she enthusiastically embraced both. 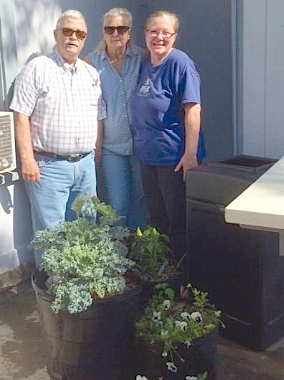 Yesterday Kevin, Margie and I picked fresh produce from the Garland Community Garden and delivered to the Good Samaritans here in Garland. We delivered 18 pounds of Okra, blackberries, stringless green beans, kale, and variety of fresh herbs. Our gardens are overflowing here in Garland. Charlie's cherry tomato bushes are loaded and they are over 7 feet tall. My blackberry bushes have already produce 20 pounds of berries. I hope that folks will remember to not only pick their harvests on a regular basis, but to share the bounty in their local communities. Speaking of bounty, it will continue to come down at the Garland Community Garden. Our hops are blooming already with more than three times the amount produced last year. We have three teepees of pole beans that are blooming. All our bush beans are already producing. The loofah are finally beginning to take off. We have two large beds of Asian melons that will soon be producing. Our two cantaloupe beds are thriving. We have tomatoes all over that are filled with green tomatoes. Our Malabar spinach is beginning to produce. Our blackberry bushes are finally coming into their own. We've already harvested 8 pounds from the garden. Peanut bushes are thriving all over the garden. This year we planted those nitrogen-fixing plants as ground cover amongst our tomatoes. Jane Stroud, one of the members of Loving Garland Green's Board, brought sweet potato slips to share with members. 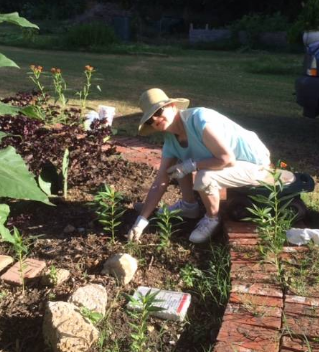 Jane, a microbiologist by profession, is also a diligent gardener and wildlife preservationist. She is the one who introduced me to the value of native bees and showed me how to build houses for them. Until I knew Jane, I didn't realize there were so many varieties of sweet potatoes. Jane shared the following varieties with us: Allgold, Arkansas Red Leaf, Becca's Purple, Cordner's Red, Ginseng Orange, Mahan/Bradshaw, Molokai Purple, Maryland Red, Texas Porto Rico AKA Red Velvet. 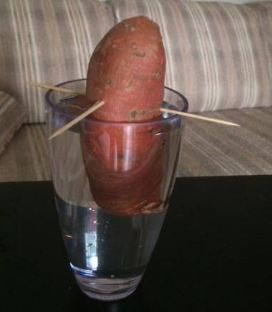 Sweet potatoes are a great vegetable to grow here in North Texas. They are great for container gardens. In fact, that's what Jane grows them in--large plastic storage containers. I am making one for the folks at the Good Samaritans. The great thing about sweet potatoes is that you can also eat the leaves. Unlike other potatoes from the "white" varieties, sweet potatoes are not members of the nightshade family. Thus you can eat their leaves while the potatoes are growing underground. The sweet potato thus produces food from about the end of June until the first killing frost here in November. We harvest our sweet potatoes here in North Texas after Halloween and before Thanksgiving (usually the first week in November). Harvest two to three weeks prior to eating. The tubers need to cure and develop sweetness.